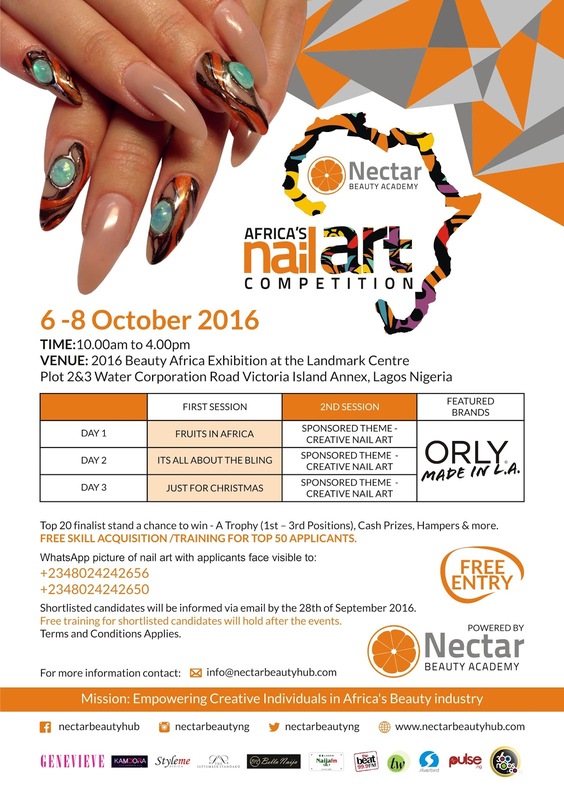 Africa’s Nail Art competition aims at appreciating existing talent as well as developing new talent in the beauty industry. The maiden edition of the competition, which was held last year, attracted well over 150 applicants. 100 applicants made the first cut and were offered free training sessions from some world-renowned international nail artists. Out of 100 applicants there emerged 20 finalists who were then entered through to the 3-day nail art competition. The competition was judged by a panel of well-respected professionals in the industry including world Champion and Regional representative from international polish brand Le Chat Nails USA. The winner of the competition went away with the trophy and a round-trip to Dubai. Consolation prizes ranged from hampers to cash prizes. The year’s edition promises to be even bigger and better with One Million Naira up for grabs! Application is now open. 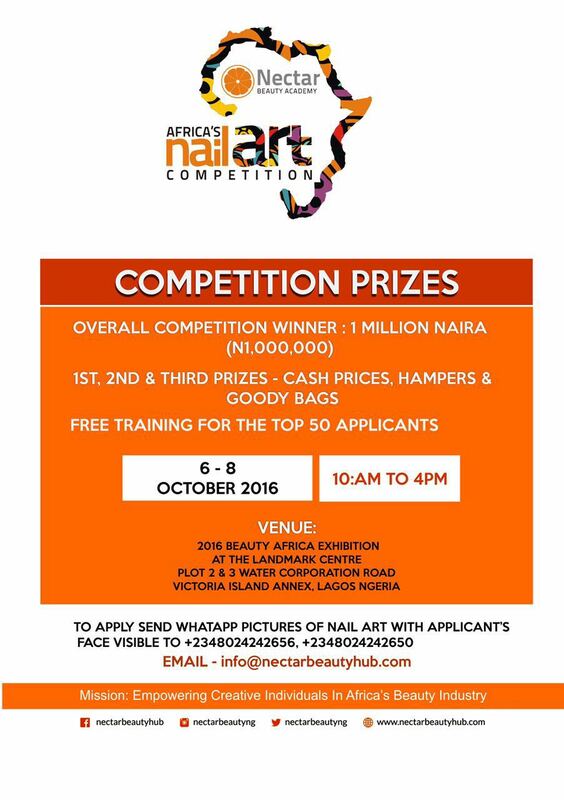 Only 20 applicants will make it to the Grand Finale competition scheduled to hold at this year’s Beauty Africa Exhibition! The top 20 finalists stand the chance to win – 1 million naira, a trophy (1st – 3rd Positions), cash prizes & products. Additionally, the top 50 applicants will be entitled to receive free skill acquisition/training. Send both pictures via Whatsapp to either of the numbers listed below. Shortlisted candidates will be informed via email by 28th September 2016. For more information visit Nectar Beauty Hub and follow @NectarAcademyon Instagram.